As the direct, face to face link to candidates on training and assessment courses, providers and course directors have a really important role to play and we'd love it if you could take some time during your courses to explain the role and benefits of MTA. It could form part of an evening discussion, a morning brief or even a question in a home paper! 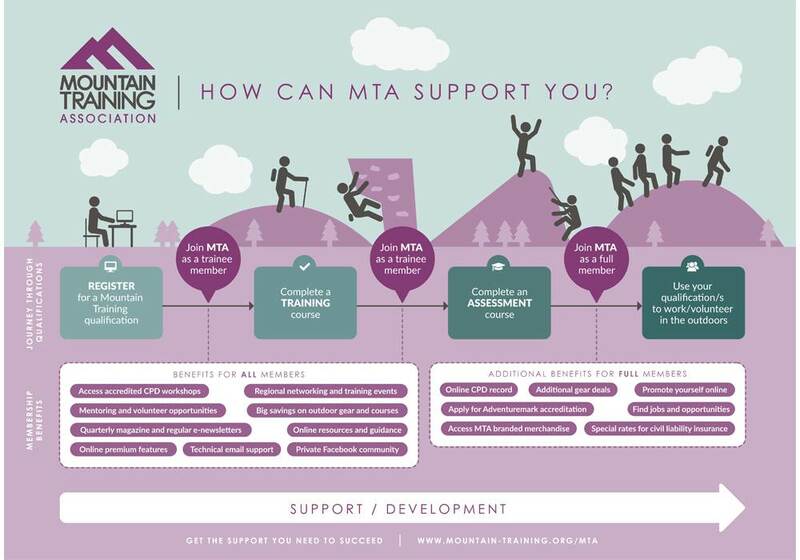 This infographic is designed to clearly and visually illustrate the various stages at which candidates can join MTA (essentially at any point after registering for a qualification) and the key benefits that they can receive as a trainee and full member. You are welcome to use some/all of these powerpoint slides as part of your Mountain Training courses. This resource is designed to help you explain the aims and promote the benefits of the Mountain Training Association to your course candidates. The full MTA presentation (as titled below) also includes a dialogue for each slide to supplement the summarised points on each page. The summary slides below provides a very succinct snapshot of MTA and highlights some of the key benefits of membership. Shortly, we'll be posting out batches of MTA leaflets to Providers, that you, as course directors can then can hand out to your course candidates, explaining the benefits of membership. These leaflets are designed to make your lives easier as we know that you have alot to get through on your training and assessment courses. If you have any ideas as to how we can help you to inform candidates about MTA please do not hesitate to get in touch here.